Why does a woman agree to sleep with a known serial womanizer? Because she naively believes that she will be the woman who will cure the poor man of his womanizing ways. Obama was given the Nobel Peace Prize merely for announcing his intent to withdraw from Afghanistan and Iraq. That is yet to happen, though the Nobel Prize would have been handy to kick-start the corpus of his election fund for his re-election. In the meanwhile, he engaged in "a little sortie" into Libya - in the naive belief, like that of the nth woman who falls for the womanizer, that (as the NY Times put it) "a quick application of power from the air would tip the balance, and the Libyan rebels would do the rest." The only thing different from Iraq was that there never was any "shock and awe"; and at no time did Gaddafi even look threatened, ensconced as he is in his stronghold, Tripoli. Now, Gaddafi has even got African Union Heads of State to recommend a NATO ceasefire to the rebels, to which Gaddafi has promptly agreed! Surprising? It won't seem, if you know that Libya along with 4 other countries (Algeria, Egypt, Nigeria & South Africa) funds 75% of the 53-Nation African Union. Given that the US by virtue of its financial support (the largest contributor and a veto right holder) is often seen as having a virtual stranglehold on the UN, why should we be surprised that Libya is leveraging its money-power to gain support from the AU? The Guardian reports that regime change in Libya is a US priority and is not shared, except in Washington, London and Benghazi. Look at the picture below: Who looks like the leader of this Group? 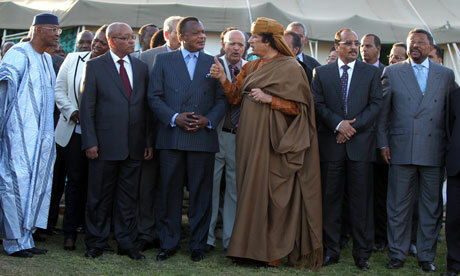 This is the AU Leaders' meet with Colonel Gaddafi at his tent-home in Tripoli. Photo: Mohamed Messara/EPA. This picture appeared here. The NATO forces have not exactly endeared themselves to the rebels by a horrible incident of "friendly fire" in which several rebels and their civilian sympathizers died. Moreover, by opening ditching Gaddafi for no discernible reason, all the bridges built between the Western democracies and Gaddafi are now burnt; and they have now created a second rich sponsor of terrorism around the world. NATO Secretary General Rasmussen has been quoted as saying, strangely somewhat, that "warplanes will keep pounding Libyan forces as long as civilians are at risk", when the truth is the reverse. In the same article, he is also quoted as saying that "While NATO has no information of any "significant" Al-Qaeda role in Libya, a protracted war could create a safe haven for terrorists", in an echo now of something I wrote 3 weeks ago, on the day the War of Libya got underway. The NDM Virus controversy is back!